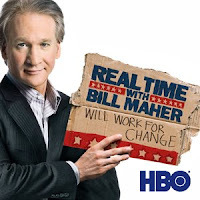 I caught a bit of Bill Maher's latest episode of Real Time where the point was brought up that "Isn't the Internet supposed to be the next real news outlet, and isn't TV a dead medium? Who watches TV any more?" (Not an exact quote.) The commenter who said that (whose name I didn't catch) was trying to refute one of Maher's points about "the media" being the cause of the health care reform not doing so well lately. How could it be the fault of "the media" (which Maher defined as TV news programs) if everyone got their news online? What they all managed to miss, though, was that Americans, by and large, aren't looking for news in the first place. They're looking for pundits to provide their selective spin on news. There've been plenty of anecdotal stories of 20-somethings getting most of their news from Stephen Colbert and Jon Stewart. And it's easy to tag Stewart and Colbert, but in that sense they're no different than Rachel Maddow and Larry King and Rush Limbaugh and Sean Hannity and Wolf Blitzer and every other "newsman" with their own show. CNN's programming scehdule reflects this perfectly. It's an allegedly all-news channel, but almost every hour is dedicated to a specific personality putting their spin on what's going on in the world. Limbaugh and Stewart are doing the exact same thing, just with a different tone. Heck, even your local news program is sold as "the news at 5 with Mark Allan and Michelle Kingsfield." It's not about WHAT they're reporting so much as WHO is doing the reporting. With that in mind, how many real news programs are left out there? All I can think of as possibilities are NPR (which is radio in the first place and partially subsidized by the government in the second), BBC (which is paid for with tax money) and newspapers (which a different medium in the first place and are collapsing in the second). Now let's turn to comic books. What do we find? The Justice League by Dwayne McDuffie. Captain America by Ed Brubaker. Comics figured out back in the 1970s that they really need to sell the personalities behind the comics, not just the comics themselves. It wasn't "The Fourth World" after all, it was "JACK KIRBY'S Fourth World." Sell the CREATOR, not the CREATION. But when we turn over to newspapers, we find The Washington Post. The Cleveland Plain Dealer. The Chicago Tribune. The New York Times. By and large, they sell the news by may-as-well-be-anonymous writers/reporters. Sure, there's some Bob Woodwards and Carl Bernsteins out there, but their names are not used to sell papers. Newspapers have sold "the news" and that's it. There's nothing wrong with selling just "the news" except that not nearly enough people want just "the news" to make a viable/sustainable for-profit company. People at large have told and continue to tell media outlets that they want "news filtered through the lens of someone more expert than me whose biases I share and whose attitude I appreciate." Which leads to comedians like Colbert, Stewart and Maher becoming newsmen to large swaths of the population. Keep in mind that I'm not passing judgment on any of these individuals. Nor am I passing judgment on how they choose to sell their version of the news to a responsive audience. As I said, it's what people are telling media companies they want to hear. But it's clear that newspapers aren't listening, and refuse to do anything different than what they've been doing for the past century. People don't want "the news" and that's pretty much all newspapers have to offer. Newspapers are screwing up all sorts of other ways, too, but the revelation that there's yet this other thing they're completely ignoring struck me this morning. NPR as non-biased news? What's their listenership, about 99% to the left? NPR is no better than CNN, just less flashy. Augie's right. NPR is by far a leftist outlet. Unlike the BBC, it's also stuck in American liberaldom and doesn't have the global outlook of the Beeb. That's true of all American media to a degree. As for the personality-driven news, it's easy to see this as a recent development but news viewers in the 1950s and the 1960s actively watched Edward R. Murrow and Walter Cronkite. I once saw an interview Mike Wallace conducted with Ayn Rand and Wallace was as combative and ideological as Keith Olbermann. As for your article as a whole, I never thought of this. I think you're right as a whole. Ahem... back in the Golden Age of newspapers, when most cities had at least two if not four or five papers, every paper had it's political spin. Both the NY Post and the Wall Street Journal (I wonder who owns them..?) are conservative. The NY Daily News is somewhere among the blue collar/middle class spectrum, reporting populist news and exposing scandal. The New York Times... bless `em, they are what a paper should be, even if they tend to ignore local news for national and international coverage. People don't read a paper for individuals? Then why do papers have Feature Editors? Why does almost every paper run an entire page without ads, a page filled with content that the paper paid good money for? Because people love the content so much that they'll cut it out and stick it on the refrigerator or their cubicle. Do you know that Feature Editors quake at the responsibility of dropping a comicstrip? So much so that they delegate that responsibility to reader polls? Woodward and Bernstein aren't used to sell papers?! Then why does every newspaper publicize their Pulitzer Prizes? "Our staff is the best in the business, offering news and reporting that is the best in the business." I'm clever enough to know when someone is offering an opinion or only one side of the story. I think most young people, growing up in an era of hype and hyperbole, can spot hucksterism and demagogery. Sure, emotions can get in the way (see: War on Terror). I wake up to 1010 WINS, an all-news (no commentary) radio station. At work, I surf Google News. When offered a choice, I usually click on the link for the Washington Post or the New York Times, as I know the report will be professional. Of course, I keep a critical eye on everything I see, but there's a big difference between entertainment (Limbaugh) and journalism (NPR). First, I didn't say NPR (or any other outlet) wasn't biased, just that they're possibly one of the few outlets that doesn't sell themselves on punditry. The human condition essentially prevents anyone from being completely unbiased, and every news outlet, no matter what sort of ideals they hold, is going to have some slant/spin on any given issue. Some places are more overt with their bias than others, but that's completely beside the point I was trying to make. I'm talking about promoting oneself as an outlet for punditry versus an outlet for journalism. Second, I'm not saying that newspapers don't have talented writers that people look for. I'm just saying that The New York Times isn't selling itself as "the paper that has Andrea Elliott" -- they're selling the fact that she (and others) won a Pulitzer, but they're not selling themselves on the writer herself. There's a difference there. Selling yourself as a Pulitzer-winning paper is highlighting a general level of quality, whereas selling yourself on Elliott herself is tying yourself to a specific personality. Even back in the day, TV stations didn't sell "Walter Kronkite" or "Dan Rather." They sold 60 Minutes. Yes, people tuned in to see Kronkite, but he wasn't the key focus of CBS's advertising strategy. Again, they were selling the quality of the program, not the people who imbued said quality into it. As for your Mike Roykos and Stephan Pastises (Pasti? ), they're not really good anchors to sell a newspaper precisely because they're syndicated. Even if the NY Times drops Dave Barry's column, it still can readably be found elsewhere. Contrast that to Dave Letterman, who can only be found on CBS. NBC can no longer say they're the network with Letterman. Think of syndicated strips and columns like milk and eggs -- every store has to carry them, but you can't sell the store with "We have milk!" Again, I'm not making any judgments on the practices various media outlets are using to promote their wares. Nor am I commenting on the quality of any outlet. Nor am I suggesting that any given outlet is more or less biased than the next. I'm just saying that the approach that newspapers are using (and have been using for the past 100 years) to sell themselves isn't working in the 21st century because they're not catering to what audiences are demanding.